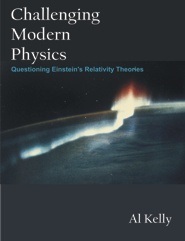 This book presents an alternative to Einstein's special theory of relativity, solves many problems left unanswered by special relativity, gives a better fit to many phenomena and experimental data and is more philosophically appealing. It is recommended to all people interested in fundamental issues of physics and cosmology. The book treats its subject properly, not just as an impersonal set of equations, but rather as a developing saga full of human triumph and failure. One learns from both experimental results and simple logical argument that all is not well with modern physics. Dr. Neal Graneau, Oxford University, U.K.
Irish engineer solves the dark secrets of space. Einstein got relativity theory wrong. Al Kelly is the author of "How to Make Your Life Easier at Work" (McGraw-Hill: N.Y.) - a bestseller in seven languages. He has to his name many innovations in engineering and science, such as the discovery that a siphon lifts water to a height greater than the equivalent of atmospheric pressure. This discovery was awarded a major prize by the Institution of Mechanical Engineers (U.K.) and has an entry in the Scientific Dictionary and the Guinness Book of Records. Al Kelly is a Life Fellow of both the American Society of Mechanical Engineers and the U.K. Institution of Mechanical Engineers.